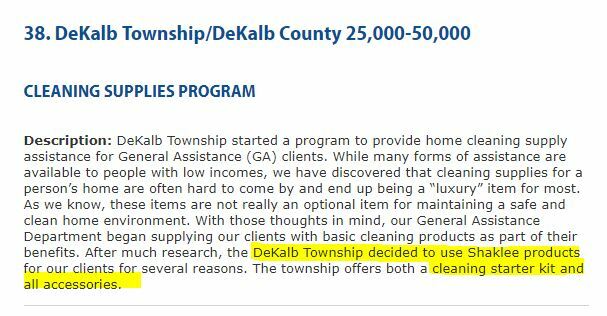 In April 2015 the DeKalb Township Supervisor announced a new program he was running thru General Assistance, and it dealt with the township becoming an independent agent of Shaklee Products. We cannot find any authority in the Township Code for a township to start its own business, and spend GA funds on that business. Township Officials of Illinois gave them an award for this, the then-Supervisor’s wife is a Shaklee Representative, and the current Supervisor (of the same last name as the previous one) is a Shaklee Representative. I have submitted a FOIA request for all payments from the township to Shaklee and will update you in another article once the records are received. See product photos and pricing (here). These claims about the products appearing in the minutes seem amazing. AS A MATTER OF FACT THESE CLAIMS SEEM ALMOST HARD TO BELIEVE! If these claims are true and factual then I need to get me some! I’m sitting here wondering if these claims are actually factual. Could they really be true? Actually now I’m sitting here reading the minutes again and these claims about the products seem almost too Fantastik (there’s supposed to be a little circle with a capital R in the circle right after the k in Fantastik but that key is missing) to be believable. What’s the impoliteness of making Fantastik claims in the minutes if they are (ahem ahem) possibly inaccurate? THAT’S A SERIOUS QUESTION! What if there has been some inserted into the official minutes somehow some way? Part two coming after I review some more documents and google that! * The products do “cost” more than what you find at Walmart/grocery store. But “cost” is relevant . Walmart/grocery stores are offering products for quick turnovers, thus “low” price. But do they work as well? If it is results you are expecting then “low” price products actually rip you off and thus are very costly. Listen, I did not like broccoli as a child because I did not try it. As an adult I tried it and enjoy it. Don’t be misled by the naysayers. Check the product out, check the industry out that the products service, and the logic of the business module. As for myself, I am in business handling Shaklee products. They work for me as a user. The business end has paid me over $800 in the last two months. Not enough to pay my mortgage, but enough to pay two car payments. And I am not even a “high level” recognized superstar yet. I have regular repeat customers so they appear to getting their value. In the video we stated that we were not knocking Shaklee, but rather the decision by by the Township to do this without authority. The concept is a good one. Folks getting aid may not have the money to purchase basic cleaning supplies. As I read it this allows them to get needed supplies with the township paying for it. However I’m like John, I don’t know that this is something the township ought to be doing. Perhaps if they had said “This is what we want to do ..” and posted a list of specified items (not products or brand names) desired and bid it, then provided to those receiving aid at a reduced cost or free … maybe.I can see the advantage to the township of having is drop shipped directly to the aid recipients. Give them credit for being creative. Corruption knows no limits. I am trying to can with you, but I can not. This is a new level of what the hell. Can I come there and start Herbalife, Mary Kay, Amway, Primerica?